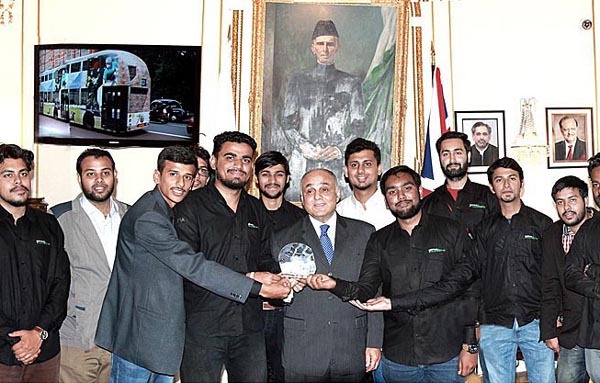 and Technology, Karachi won “Breakthrough Award” on building an outstanding car in the Formula Student competition in London. 85 leading international engineering universities from 65 countries, a press release received here said. Formula Fusion’ was given a reception at the Pakistan High Commission on August 3. Abbas, appreciated the team work demonstrated by the students during the preparation and competition. Pakistani students were making their mark at the international competitions which was a testimony of their unparalleled talent and also wish them a bright future. represent Pakistan at the world’s largest student motorsport competition in the UK. very first time in this mega competition. renowned judges of motorsports but also received appreciation memento of a BMW F1 aerodynamic part from F1 specialist William Toet. the UK. Student teams from around the world design, build, test, and race a small-scale formula style racing car. The cars are judged on a number of criteria.